Please copy and paste ' [[Category:Gourami]] ' into the end of your article to include it in this category. The gouramis or gouramies are a family, Osphronemidae, of freshwater perciform fishes. The fish are native to Asia, from Pakistan and India to the Malay Archipelago and north-easterly towards Korea. Many gouramies have an elongated ray at the front of their pelvic fins. Many species show parental care: some are mouthbrooders, and others, like the Siamese fighting fish (Betta splendens), build bubble nests. Currently, about 90 species are recognised, placed in 4 subfamilies and about 13 genera. The name Polyacanthidae has also been used for this family. Some fish now classified as gouramies were previously placed in family Anabantidae. The subfamily Belontiinae was recently demoted from the family Belontiidae. As labyrinth fish, gouramis have a lung-like labyrinth organ that allows them to gulp air and use atmospheric oxygen. This organ is a vital innovation for fishes that often inhabit warm, shallow, oxygen-poor water. 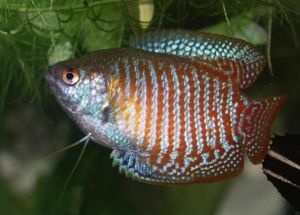 See here for a list of Gourami common names. This page was last edited on 21 September 2015, at 14:26.